If you are looking for a simple, streamlined, minimalistic approach to unblocking content, Hola may just be the VPN that you are looking for. Hola is free at the basic level and has an intuitive user interface with optional settings for beginner or advanced users. Its flexibility and the nonexistent price tag make it a great choice for casual or infrequent use. The free Hola service does have some drawbacks, however, so it will not be suitable for all users. It cannot unblock all websites, and it also can only be used for four hours a day. The good news is that you can easily and cheaply upgrade Hola to Premium for just $5.00 per month. If you subscribe annually, you can save money with a yearly subscription discount. This allows you unlimited daily use and provides you with some other great features. The limitations with unblocking certain sites still apply. In theory, you can add user generated scripts to unblock certain sites. Unless you are a scripter yourself, though, you will be relying on scripts by independent third parties, which may or may not work as advertised. And unfortunately sometimes Hola Unblocker is a little bit slow. You are browsing on a public network you do not trust, and you want to encrypt your transmissions. You are trying to access services that are blocked on your network, such as Gmail. You want to watch streaming content which is blocked in your region. This is probably the most common use of Hola. The service even provides you with quick links to some of the most popular channels so that you can get on to the content you want to watch. You are trying to speed up your connection. This may or may not actually work as desired. 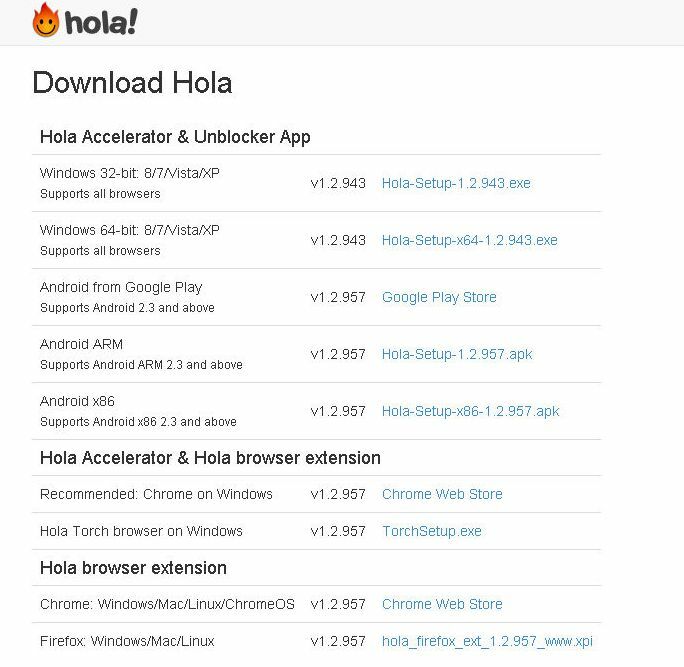 Hola is theoretically supposed to speed up your internet through a special peer caching system. This works better for some users than others; for some it does not work at all. The performance depends partly on how many other Hola users are in your area. Hola offers controls for advanced users, including the ability to add custom scripts to unblock sites the program does not unblock on its own, but it really is designed largely for basic users who are not all that technical. If you are searching for a casual VPN solution, this program may be perfect for you. If you want the best in advanced security and customization, you probably will want to find another solution. Microsoft Windows: Windows 7/8, Vista, XP, 2000, NT. iPad, iPhone, and iPod: Coming soon for Premium Hola users. You can run Hola on an Android if you download the Hola Android app. You can also use the program on a Mac or PC in one of two ways. You can either download the program separately (necessary if you use Internet Explorer and cannot use a browser extension), or you can run it as a browser extension in Chrome or Firefox. Make sure that if you have an antivirus program such as ZoneAlarm or AVG Antivirus that you whitelist this program. Otherwise it will not function. Taking a few minutes to check your antivirus settings can save you from a lot of hassles when you install Hola. The basic version of Hola is a free service, as previously mentioned. Free Hola is great if you do not plan to use Hola for more than four hours a day. If you do, you will want to go ahead and upgrade to the premium version. If you want to try Hola Premium without paying for it, you can enjoy a free trial simply by referring a friend to Hola Premium. Hola is very reasonably priced at $5.00 per month. Want to save money? You can purchase an annual subscription at a discount, which comes out to $3.75 per month. You can put a stop on your annual subscription at any time, just as you can with your monthly subscription. Hola Premium will automatically charge you for your payments each month, unless you tell it not to. If you go to the Premium page, you can easily turn off auto-renewal and pay for your subscription manually each month. Hola’s payment policies are very flexible, and their costs are quite low for what they offer. Unlimited daily use. You are no longer confined to just four hours a day. Tab VPN allows you to access more sites (but still not all). You are never used as peer. You can use multiple browsers to access your account. Hola Premium will soon support iPad, iPod, and iPhone. SSL encryption on all sites coming soon for premium users only. No refund policy is stated on the company’s website. As you can cancel your account at any time however, this should not be an issue for most users. Unfortunately, there is no official data from Hola on the diversity of its IP address pool. There is also no option to specifically control the IP addresses which are assigned to you while you are using the service. You can however choose from a number of countries from which to browse. This allows you to control that aspect of the IP address. You will be assigned one by the program which matches the region you have chosen. While no specific limitations on bandwidth are mentioned on Hola’s official website, there is the usage limitation of four hours a day for non-subscribers. Paying $5.00 per month lifts this restriction. Hola comes with beginning and advanced configurations. You can choose how much control you have over the detailed settings. If you are brand new to VPN, you will find this program incredibly easy to use. You can enable and disable the extension with the click of a single checkbox, and easily navigate to popular destinations using Hola’s pre-populated list (Hulu, Netflix, Pandora, BBC, etc.). Users report very few disconnects while using Hola, making this one of the more stable free VPN services out there. Some users do report occasional bugs which can crash the extension, however, and issues with antivirus programs may sometimes cause the program to go offline. Checking your antivirus settings and telling your antivirus software that you trust this program can prevent this. In theory, Hola is actually supposed to speed up your internet, but in reality, most users report that it can be very slow, particularly on sites where you are trying to watch video. To all indications, it is not so slow as to be terribly inconvenient, but it does not seem to speed up the internet all that much. A random speed test shows a download rate of 5.67 mbps and an upload rate of 0.77 mbps. That is actually a faster download speed than we have seen with a number of other VPN clients, so even if Hola can be “slow” from time to time, it still may provide superior performance to competing free programs. 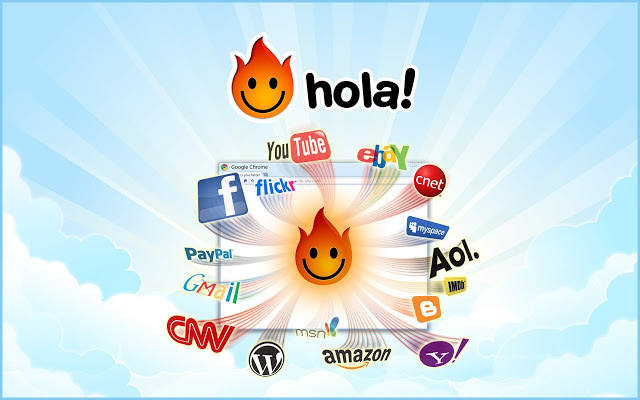 Hola changes your IP address regularly as your browse to provide you with anonymity. Some or all traffic is passed through an encrypted connection, depending on the settings you choose for your proxy. SSL encryption is coming soon for premium subscribers, which will make browsing even more secure. Since you can control the country setting for your IP address, that gives you an additional option to boost your security as your browse. Hola provides support via email, telephone, fax, and also provides an address for paper mail. The fact that they provide a phone number is great; not a lot of free VPN companies do this. Most only provide an email address for contact. We have seen a couple of reviews however which indicate the support is not all that helpful. Hola is a free VPN service with the option to upgrade to premium, designed mostly to watch videos that are blocked in certain countries. As a free service, it is fairly limited, but if you are only looking for an occasional solution, and you do not plan to watch more than four hours of video per day, Hola may fulfill your needs. Plus, Hola is very easy to install and learn how to use, and far less technical and complicated than many other VPN services. This may make it ideal for casual users. For $5.00 per month, you can do away with the four hour limitation and watch as much video as you want. It is great that you can control what country you are viewing from—essential actually with many different channels online. 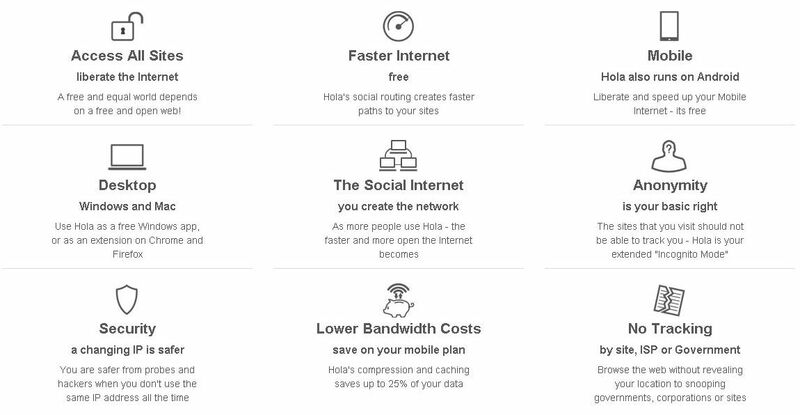 For some users, Hola may speed up internet; for others, on certain sites, it may slow it down. All in all, Hola is a good choice if you want something simple, basic, and no frills with which to watch blocked video content.